Human beings are embedded in a set of social relations. A social network is one way of conceiving that set of relations in terms of a number of persons connected to one another by varying degrees of relatedness. In the early Jesus group documents featuring Paul and coworkers, it takes little effort to envision the apostle's collection of friends and friends of friends that is the Pauline network. The persons who constituted that network are the focus of this set of books. For Christians of the Western tradition, these persons are significant ancestors in faith. While each of them is worth knowing by themselves, it is largely because of their standing within that web of social relations woven about and around Paul that they are of lasting interest. Through this series we hope to come to know those persons in ways befitting their first-century Mediterranean culture. What can we discover about the author of the third gospel and Acts, the companion of Paul whom tradition names Luke? How might that enable us to better appreciate the writings he produced that comprise roughly a quarter of the New Testament? 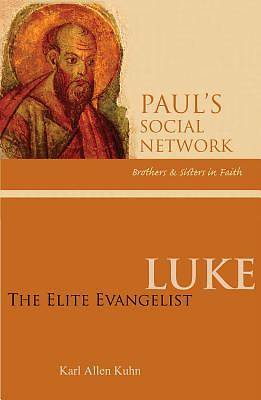 Using literacy in the Greco-Roman world and Luke's advanced literary acumen as his primary clues, Karl Allen Kuhn argues that the evangelist was a member of the social elite. Social scientific models tell us that as an elite, Luke would have benefited from a highly stratified social and economic hierarchy that ensured the flow of wealth and resources to a few at the expense of the many. And yet, Kuhn argues, scene after scene of Luke's narrative challenge the stratified world shaped by Rome, calling its readers to embrace a new Kingdom and a new Lord. Writing to the most excellent Theophilus," Luke calls upon his fellow elites to join him in leaving behind the world that has given them so much and to devote themselves not to the Emperor but to the true Savior of humankind. "Karl Allen Kuhn is associate professor of religion at Lakeland College in Sheboygan, Wisconsin. He is the author of numerous articles on Luke and biblical interpretation, and coauthor of the Lectionary commentary "New Proclamation, Year C, 2010." His books include "Having Words with God: The Bible as Conversation" and "The Heart of Biblical Narrative: Rediscovering Biblical Appeal to the Emotions."